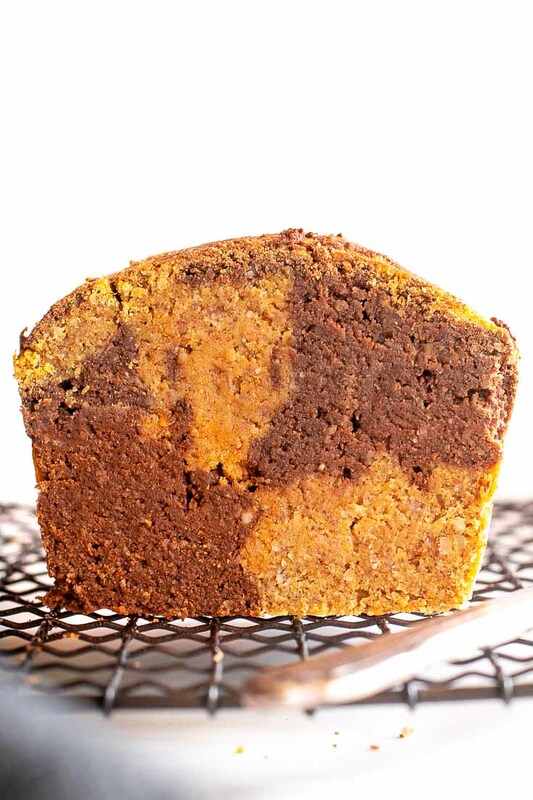 What better way to celebrate this glorious season than with a decadent slice of super moist gluten free pumpkin bread, swirled with chocolate, and sprinkled with cinnamon and nutmeg. Guaranteed to make your house smell amazing. Enjoy it for breakfast, dessert or as a midday snack — really, any time of day and every time of year are the perfect reason to enjoy this low carb bread! Because those of us sticking a low carb foods shouldn’t have to miss out on a holiday this delicious! 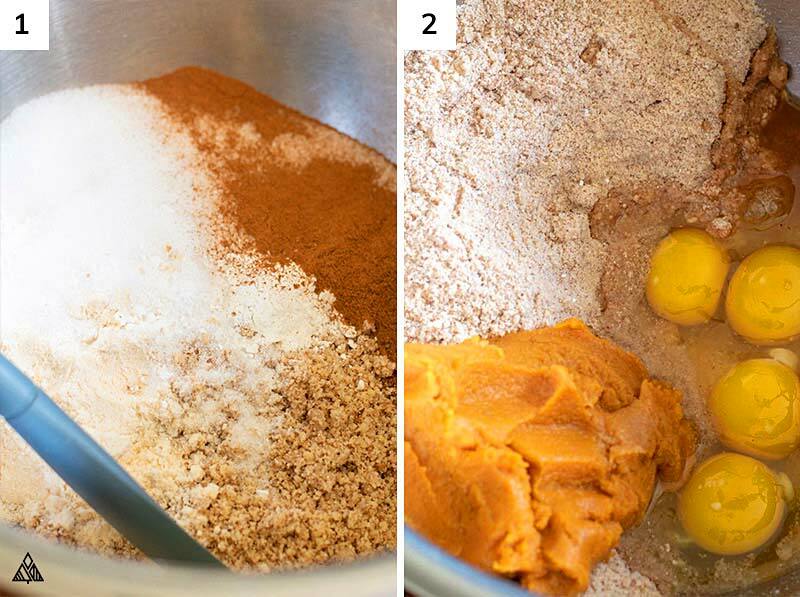 So turn on that oven and let’s bake some gluten free pumpkin bread! 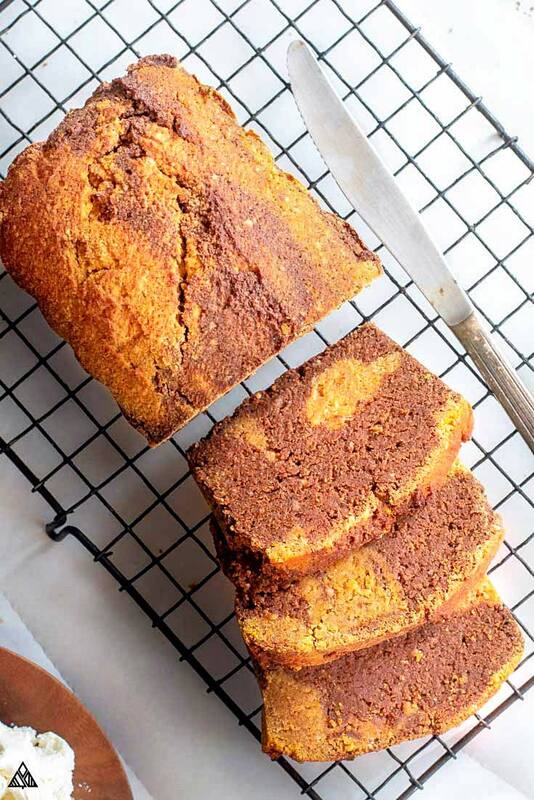 The obvious gluten offender in regular pumpkin bread is wheat flour — which seems like an easy swap, but gluten free / low carb flours lack certain baking properties of traditional wheat flour — Which is why we’ll need two gluten free flours to make this delicious gluten free pumpkin bread almond flour and coconut flour. Almond flour is most similar to wheat flour in taste, color, consistency and mouth feel. It’s also a heavier flour, and lacks the binding property of wheat, which is why additional eggs, psyllium husk or xanthan gum are typically used in gluten free bread recipes. Coconut flour is a drier flour which tastes best when combined with other gluten free flours. 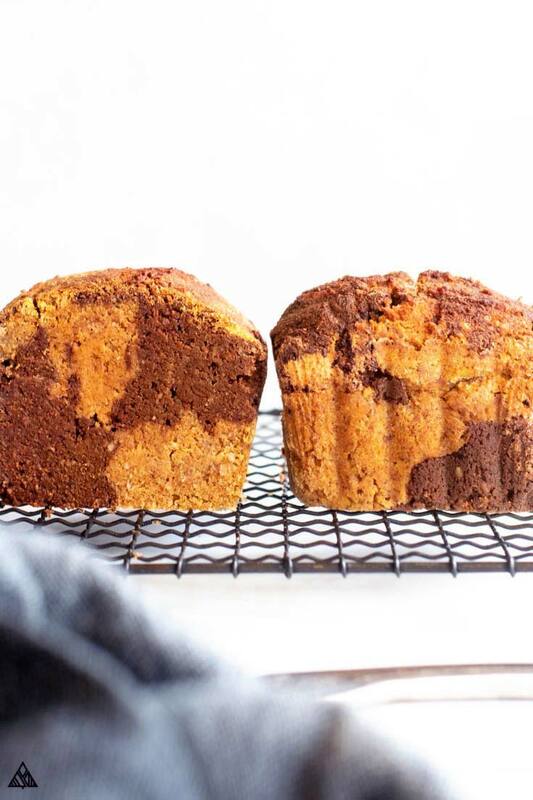 This low carb shopping list ingredient is an awesome addition to our gluten free pumpkin bread, as it helps soak up the pumpkin — without it, this gluten free pumpkin bread coconut flour would literally crumble into pieces. I use a combo of nutmeg and cinnamon to add holiday cheer to this gluten free pumpkin bread — feel free to swap with pumpkin pie spice if you have that on hand! Alternatively, you can leave ‘em out, are add some in — ground ginger, allspice, cloves, whatever you’re feeling. 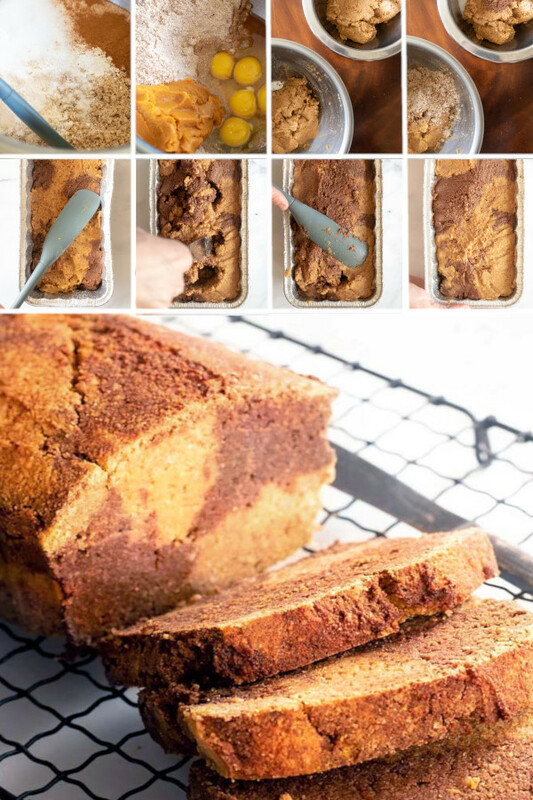 Canned pumpkin puree can be found at most grocery stores this time of year — although it can be rather expensive and hard to find out of season — check Amazon for best prices and to buy in bulk, so you can make this gluten free pumpkin bread recipe with canned pumpkin all year round! This recipe is a sugar free pumpkin bread recipe, due to the keto sweetener I used call erythritol. Erythritol is a sugar alcohol extracted from certain root veggies and fruit. It’s easy on the stomach, contains zero calories, and has no effect on blood sugar — can’t ask for more than that! If you’d prefer a traditional sweetener in your gluten free pumpkin bread, swap erythritol with whatever you have on hand. Keep in mind that erythritol is twice as sweet as table sugar. Mix the dry ingredients together, be sure to leave out the cocoa powder, 2 tablespoons of erythritol and ¼ cup of almond flour. Separate the batter into 2 even bowls. In one bowl add the cocoa powder + 2 tablespoons of erythritol. In the second bowl add ¼ cup of almond flour — stir to combine. 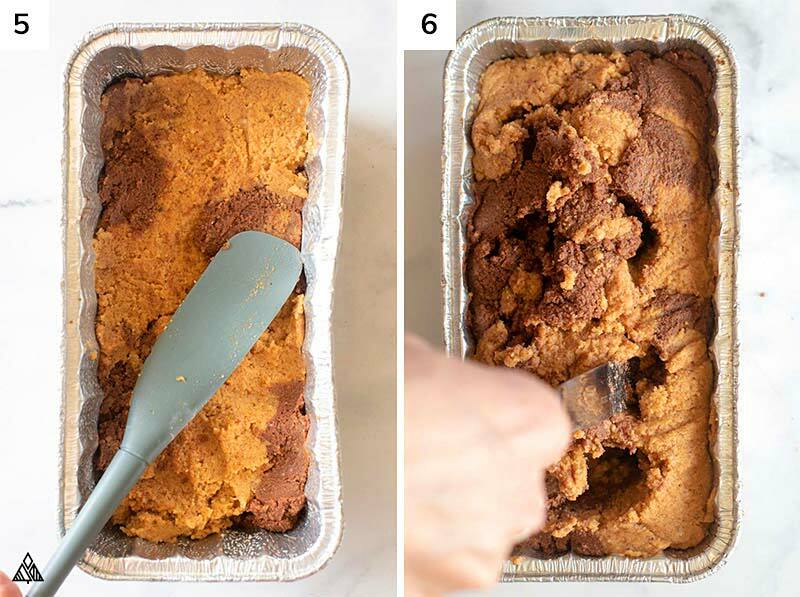 Spoon the batter into a bread pan prepared with cooking spray or parchment paper — switch off between the cocoa powder batter and the regular pumpkin batter. I did this in two layer to mix the colors. Using a butter knife, twirl the ingredients around to create a “swirl” effect. Smooth the top of the batter with rubber spatula. 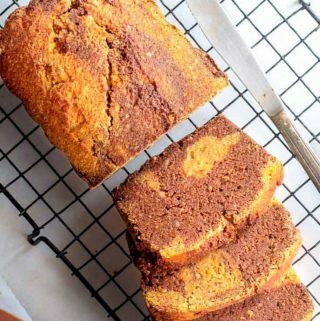 If you’re eating paleo, this recipe can easily be converted to paleo pumpkin bread by swapping the butter for coconut oil and the erythritol for coconut sugar. You’re also going to want to skip that cream cheese frosting, sorry friends. Low carb nuts: chopped pumpkin seeds, pecans or walnuts are perfect. Chocolate chips: sugar free chocolate chips, dark chocolate chips — whatever you prefer. I also LOVE adding a healthy dollop of cream cheese to a toasted slice of gluten free pumpkin bread. Yum, yum, yum! 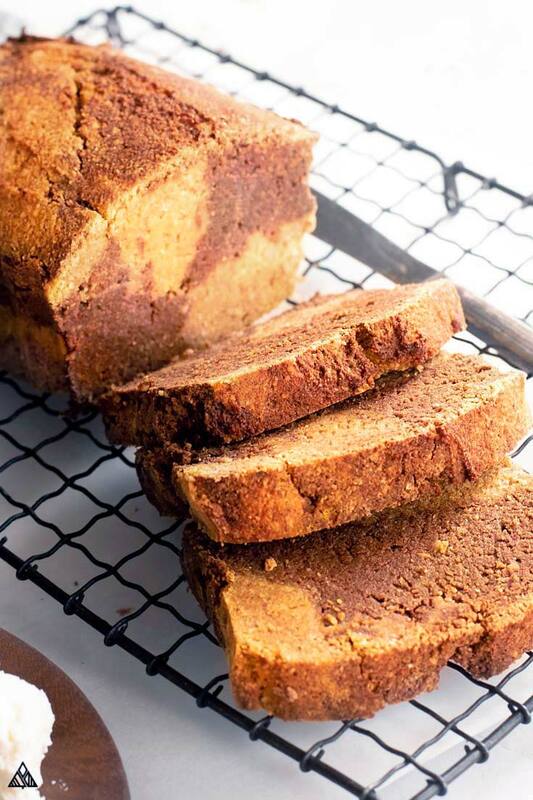 Enjoy this keto pumpkin bread on its own for breakfast, dessert or a midday snack. If you’re feeling adventurous, try making gluten free sandwiches with 2 slices! Or serve a toasted slice with some eggs — you really can’t go wrong. Let’s make some gluten free pumpkin bread! Let me know whatcha think in the comments below. Hope you enjoy — wishing you a deliciously pumpkin-y holiday season! This super easy, chocolate swirled Gluten Free Pumpkin bread recipe is the tastiest way to celebrate the season! Preheat oven to 350 F and prepare an 8” bread pan with cooking spray or parchment paper. In a medium bowl, combine eggs, pumpkin puree, butter, vanilla. In a separate bowl, combine 1 ¾ cup of almond flour, coconut flour, ¾ cup of erythritol, baking powder, salt, cinnamon, and nutmeg. Add the wet ingredients to the dry ingredient bowl and stir until fully combined. Seperate the dough into 2 mixing bowls. In one bowl, add cocoa powder and 2 tablespoons of erythritol. In the second bowl, add the remaining ¼ cup of almond flour. 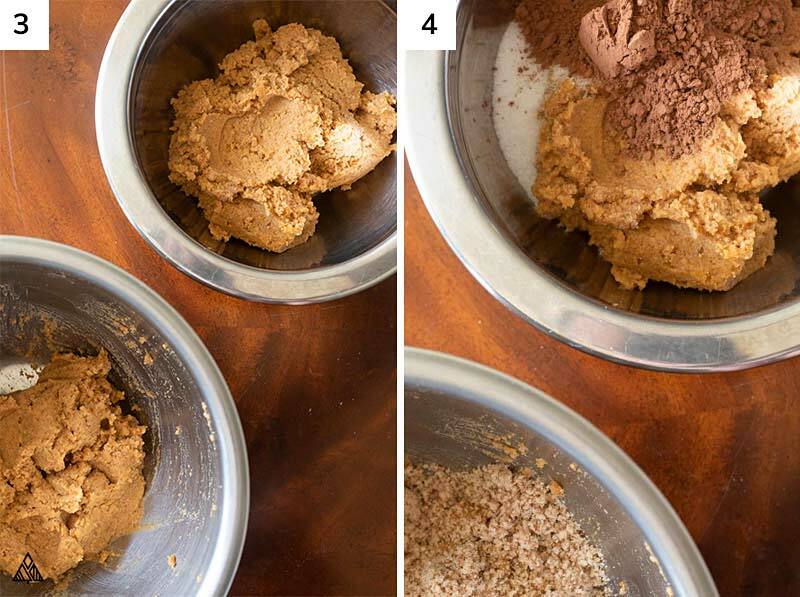 Place the batter by the spoonful into prepared bread pan, switching between the cocoa and almond flour combos. 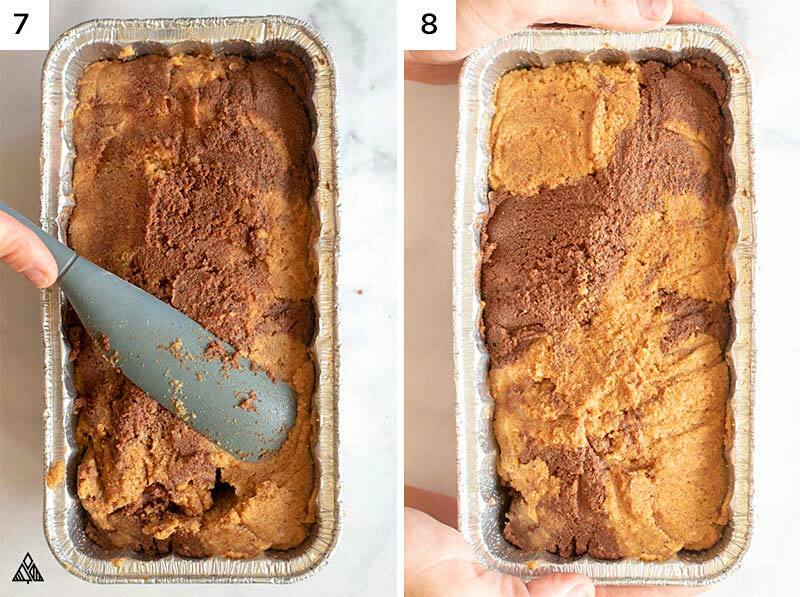 Use a butter knife to “swirl” the dough. Flatten the top of the batter with a rubber spatula. Cook for 1hr - 1hr 10 minutes, or until a toothpick in the center of the loaf comes out dry. Allow the bread to cool in the bread pan before slicing. Enjoy! Recipe adapted from my Low Carb Pumpkin Bread recipe. Nutritional information is based on 1 slice, if you cut this bread into 12 slices. If you’d like to cut some carbs, try using less erythritol. If this recipe seems like too much work, there are plenty of gluten free pumpkin bread mix options on Amazon and Walmart — although they’ll be higher in carbs than this recipe. Heck ya, this batter can be poured into muffin tins for low carb pumpkin muffins! A perfect and portable holiday snack, paleo pumpkin muffins even make for a delicious breakfast!! Because no Thanksgiving is complete without it, check out this paleo pumpkin pie recipe. It uses a buttery low carb pie crust made from almond flour! If you’re looking for more low carb recipes, check out these low carb pumpkin muffins! I tried a number of times to make Gluten Free Pumpkin Bread but somehow, its getting very dry and when I try to slice it, it crumbles. I am strictly following your instructions but in vain. Could you please let me know what is it I am missing.